Virtual reality is more than an emerging technology. It's redefining how filmmakers tell stories and connect with audiences. And it's causing a philosophical fissure among movies' ranks, dividing those worried about giving viewers too much control and those who want to push the boundaries of an art form that's been around for 126 years. Steven Spielberg may think virtual reality is dangerous for filmmaking, but others are embracing it as an immersive form of storytelling that allows them to impact an audience in ways previously unimaginable. Felix and Paul Studios is of the latter school, taking hold of VR cinema and running with it. 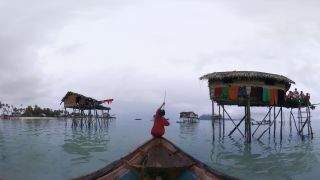 Its documentary experience Nomads launched on the Oculus Store for Samsung Gear VR last week, though the studio has produced virtual reality films of every stripe for the past three years. Each Nomads episode chronicles life in a different nomadic tribe: the Maasai of southern Kenya and northern Tanzania, the Bajau, who live on the waters of South East Asia, and Mongolian herders. There's no narrator for these pieces - an app acts as your guide, but once you step into the nomads' worlds, you're on your own. Paul Raphaël, co-founder and creative director at the studio, knows Nomads offers something special. I spoke with him recently about what sets the series apart, how VR is pushing the boundaries of cinematic storytelling, and what the future holds for a medium that's still finding its way. Techradar: Tell me a little about Nomads. What will people see and experience in the series? Paul Raphaël: Nomads is an extension of work we started 10 years ago, well before we even got into VR. We were interested in creating more experiential forms of storytelling and documentary filmmaking. At the time, we were doing a lot of exploration of 3D cinema, creating experiences where you were learning about and experiencing different cultures. We were shooting in the backstreets of Shanghai. We wanted to inform not so much through didactic information, but a direct impression to the viewer. Nomads was one of the first projects we started doing in virtual reality in 2012. We've been shooting one piece every year, and shown them throughout the years. We just recently launched them online and through the app. The application is the first thing you encounter. It sets the tone; it's the waiting room. The experiences are about 10 minutes each. The pace is pretty contemplative, probably between five and 10 shots per episode, a good average of 45 seconds and over for each. Most experiences are either focusing on a family in a nomadic tribe, or generally within a single tribe. We really focused on either a family or a village, and shot everyday scenarios to represent daily lives. Did you find any common thread between the three nomadic groups? A commonality that I think has drawn us to this subject as immersive story tellers is a much, much slower pace of life. It's a lot less about staying and viewing as it as about being. This is something in the medium of virtual reality that it's very, very strong at portraying as opposed to other cinema. A calm, almost meditative quality to being in any of these places. Myself, as an avid meditator, had an amazing, almost spiritual experience going to these places. I don't want to say it's a contact high, but you spend enough time in intimate immersion and you really start to get to feel how they feel, see the world through a different pair of eyes. One of the things I'm trying to do with these experiences is to get the viewer to have this shift in world view and perspective. You're going for immersion - do you think VR is the ultimate immersive experience? After reality and maybe certain forms of immersive theater... I think virtual reality still has room to grow, but by far it's the most immersive medium out there. It's why we dedicated ourselves to this medium for the last three years. There's a lot to discover and we're just starting to scratch the surface of what this medium can achieve as we develop a storytelling language. I'm talking storytelling in the broadest sense possible. How do you maintain continuity through shots? With Nomads, it's almost musical in its structure, more about an emotional flow than about a series of things happening or a logical evolution. As these things progress, we're constantly surprised how deep you can go with this medium. A lot of questions from filmmakers and people coming from different art forms is, how much storytelling can you have in VR? All the tricks of the trade no longer apply to this medium, because you give the audience so much control. How much storytelling can you have in VR? All the tricks of the trade no longer apply to this medium, because you give the audience so much control. I do think it's the ultimate immersive medium so far, until we have an even more direct way of experiencing something. VR is still so new, there have to be some unique challenges to shooting for it? There are a ton of challenges. The ones you've probably heard most about are technical, but one of the biggest challenges is storytelling. That's what we're focusing on at the studio. How do you take a new medium that's essentially experiential and try to do something like tell a story? Up until now storytelling has been representative; you're telling the audience what they should be seeing or feeling. You are being told something that happened in the past. Yes, you are immersed in the sense of being taken on a ride or an emotional journey, but with virtual reality, the feeling is always that this is happening right now. It goes way beyond the technical challenges. It's almost this philosophical shift about what it means to tell a story because you're really putting the viewer in the center of it. We've always had the notion of suspension of disbelief, but this medium takes it to a whole other level because you are in the center of something that's not real, but you're trying to make the viewer forget that. You're plunked in a physical space where they aren't really there. It's about finding ways to sort of gracefully pull in the viewer, whether in fiction or non-fiction. It's really the biggest and most exciting challenge. So, what is your studio doing specifically to overcome the challenge of storytelling in VR? You've probably heard the concept of presence in VR? We took that as the foundation of any decision we make in a piece. Presence is not automatic in the medium - it's enabled, but it's something that can still be crafted and nurtured. Anything that breaks that will just hurt every aspect of what you're trying to do. Presence is an emotional amplifier, though it may come at the cost of something you really wish you could do. If that was the case, my call would be no, let's not do that because it's breaking presence. At the same time, you can make decisions to enhance presence. Looking at our work, the documentary work, we're studying the chemical reaction to how someone reacts to reality shot for VR. How does VR portray reality? We're trying to understand and build on that. With Nomads, we started linking shots together, but it's very loose, the loosest possible way to make storytelling. How do you hold onto the structure without the "tricks" of storytelling? We're applying this to fiction as well. We're building on what we've learned through documentary work, taking small steps and taking risks in every new project. I've always been curious, how long does it typically take to shoot for VR? Is it much different than shooting for traditional film? It's hard to quantify because it depends on how long the piece is and how complex it is. There's no direct comparison to traditional cinema. The equipment is pretty complex, so it takes a bit longer to set up a shot. Post-production may be a bit longer, because you still have to process the image, assemble the 360 image, but it's hard to do an apple-to-apples comparison. This may not be fair to ask since you work on both fiction and non-fiction films, but is there a genre you think will ultimately benefit from virtual reality? I don't know what will ultimately be. Documentary is really a lot more native to VR, at least today, because you don't need as much of the language. You just need to kind of get out of the way. It's not automatic, but there's a lot less to figure out. If you are trying to tell a fictional story, you need a language. That's what's evolved over decades if not hundreds of years. That puts fiction at a disadvantage. Documentary comes more easily to the medium. In the long term, I think a lot more people are looking at fiction to help the medium take off. Where's the killer app in VR storytelling? That has yet to happen. I'm pretty convinced it's going to happen, but right now it's more of a challenge. Instead of just putting the Nomads pieces onto the Oculus Store, you launched them along with an app. Why did you feel an app was the right approach to delivering the series? It was really important for us to create context towards these experiences, because they are so bare, so stripped down from any sort of information. I think very few films in other mediums are that stripped down. Where's the killer app in VR storytelling? That has yet to happen. We didn't want this to be seen as deliberate, as trying to be mysterious and completely lyrical. It really was a question of, this was the best way we thought these places could be represented. The app serves as a companion to the piece. It gets you in the right state of mind before you enter such calm pieces. You'll be in your living room, put on a headset, and all of a sudden you're in the middle of some village in Borneo. Films usually have logos, credits, the virtue itself of going to the theater and turning off the lights, that sort of takes on that roll of preparing and putting you in the right mood. It's a very moody app that launches you into the experience, and I think it's an integral part of the experience. Last one: Nomads launched for the Gear VR, though it is coming to the Oculus Rift. What do you think of mobile VR? Is it going to take off, more so than headsets like the Rift or HTC Vive? With mobile, you don't have positional tracking, though we are working in partnership with positional tracking that will allow you to move around more. So that will trickle down to mobile devices. That being said, I do believe mobile is going to be a huge, huge, huge enabler of the medium. Google's [Daydream VR] announcement is absolutely massive, and there's already millions of Gear VRs out there. Cardboards will just get better out of the box. Even with Cardboard, you will have a pretty damn good experience. I'm convinced mobile is going to allow hundreds of millions of people to have a VR experience, and I'm very much looking forward to that.